Ancient Crete evokes for many the image of a highly sophisticated civilization: peaceful, artistic, and refined; a society in which women were highly visible and important, and the supreme deity was a Goddess. Yet despite the fact that authorities acknowledge that women played a major role in Minoan society, and the preeminent Minoan deity was female, there is a gap in the scholarly literature regarding the role of women and matriarchy in Minoan Crete. The debate over whether or not Bronze Age Crete was a matriarchal society continues to be heated and unresolved. It is the intention of this dissertation to advance the discussion toward a more complex, detailed, and certain conclusion. Using archaeomythology as the primary methodology--a methodology pioneered by archaeologist Marija Gimbutas, which incorporates a consideration of linguistics, mythology, history, and folklore as well as archaeology--this dissertation follows several lines of approach. 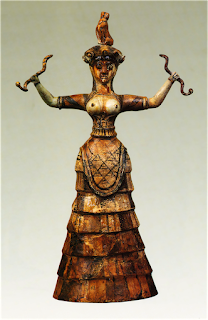 First, by reviewing the archaeological artifacts, architecture, and religious iconography, and by surveying a wide range of archaeological and archaeomythological studies and interpretations, it shows that in Bronze Age Crete a Mother Goddess was worshipped as the primary deity and that Minoan Crete was a Goddess-centered society. Second, it argues that Minoan Crete was also a women-centered society. To illustrate women's central religious, social, economic, and political role in Minoan society, Minoan art--frescoes, statues, seals, and rings--along with the remains of temple-palaces, towns, tombs, and residences, are interpreted from an archaeomythological perspective. Archaeological data as well as historical and mythological clues provide substantive evidence for a matriarchal system. This in-depth study utilizes the latest archaeological findings and the emergent fields of archaeomythology and modern matriarchal studies to make a compelling case for a matriarchal Bronze Age Crete, based on our expanded knowledge and contemporary understanding of matriarchy. The definition of matriarchy advanced by Heide Goettner-Abendroth is determined to be applicable to ancient Crete. Some renders i made inspired by woman's dominant role in ancient Minoan Crete. She rules, thousand years ago. Αναρτήθηκε από Amazon Creations στις 6:24 μ.μ.